What is a Homebrew Club and Why Should I Join One? In the world of homebrewing, there are many types of brewers, but most people fall into one of two types. Type 1 – You don’t brew a lot. You don’t think about brewing a lot. You don’t talk about brewing a lot. Type 2 – Brewing brewing. Brewing, brewing brewing brewing… brewing. I fall deeply into the latter category. I’m sure at times my wife and friends grow tired of hearing about it. They really don’t care what my original gravity was, or the temperature of my fermentation, or why I put the hops in at a certain schedule… even though I’m going to tell them anyway. I’m sure when they know I’ve recently brewed a batch, they consider running the opposite direction. Hell, my wife doesn’t even like beer *gasps*, but she puts on a nice smile when I begin rambling about it. 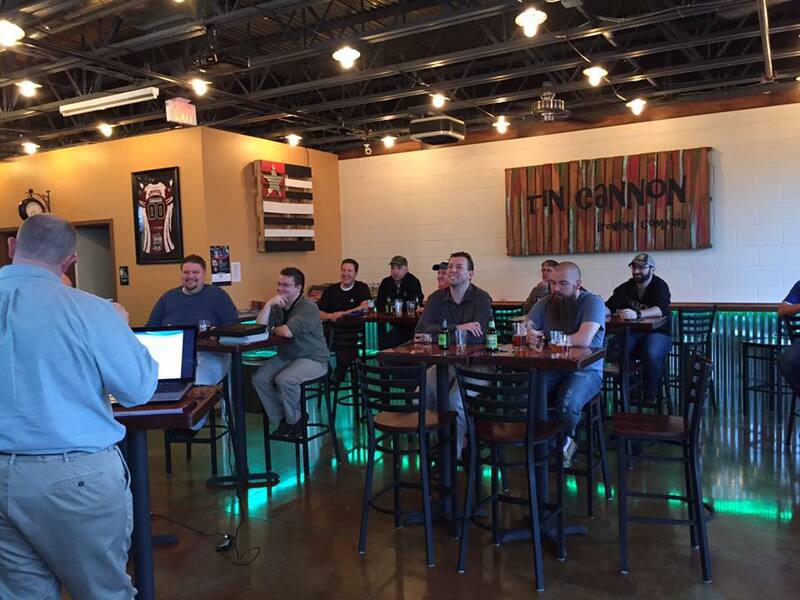 A homebrew club is everything your nonstop brewing obsessed brain desires. It is a place for homebrewers to get together to share experiences and knowledge, enjoy other peoples creations and participate in a myriad of brewing activities. Homebrew clubs come in many forms. Some meet a lot, some meet very infrequently. Most charge some form of dues, however you may find yours does not. This money will usually help pay for the cost of renting a location, competition awards and supplies. Some clubs are comprised of solely of the previously mentioned type 2’s and some include a good mix of all types of brewers. I was apprehensive to join a homebrew club at first. I’m what you could call an introverted extrovert. I generally like to be left to my own devices, but if I need to I can flip the personality switch and be extremely social. My main concern was that joining an established club, and being the new guy, I may not be welcomed to the group and I would immediately want to crawl back into my hole never to return. I could not have been more wrong. Turned out that the night I decided to attend my first meeting, I was not alone. 3 other people decided to attend for the first time. Within minutes people were approaching us with samples of their recipes, asking about the beers we brought and telling us the many reasons we should join their club. It was one of the more easy going groups I’d ever encountered. I became a dues paying member of Downright Obsessed Homebrewers (DOH!) at the next month’s meeting. Meeting at Tin Cannon Brewery and learning about the styles for one of our upcoming competitions. When people find out I’m in a homebrew club, the first assumption is we just get together and get blitzed off each other’s beers. While I will admit to having gotten more than a bit tipsy with members of my club, it is often the furthest from our minds. Being in a club has expanded my brewing vocabulary and knowledge. You see, we’ve all experienced the mothering effect that your friends and family will take when trying something you’ve made. People who love you don’t want to hurt your feelings. You could probably pee in a bottle, get it carbonated and your closest friend will probably tell you how great it is. Now, he might go puke in the ficus in the corner of the room when you aren’t looking, but not without telling you that you should open your own brewery first. Brewers will be honest. They’ll be critical. They’ll be helpful. That off flavor you’ve had in every beer you’ve made for 3 years? Another brewer might know what it is and instead of letting you turn another batch of beer into a musty old gym sock or a used baby diaper, they’ll drop some knowledge and experience. If improving your ability to brew quality beer was the only advantage, it would still pay its weight in gold. While I’m sure not all homebrew clubs are created equally, most follow the same general practices. Most meetings include a seminar of sorts that may range from how to brew certain styles to tips and techniques. Our club hosts bi-monthly member only competitions for specific styles, with awards given out to 1st, 2nd and 3rd. We meet monthly at a local brewery that opens up for us on one of the nights they are closed, although you may find your club meets at someone’s home or even at a local lodge or VFW Post. We’ve also been invited to participate in Big Brew Days at other local breweries and we’re planning a brewery tour of local breweries. Panoramic shot of DOH! members participating at the American Homebrewers Association Big Brew Day held at Old Bust Head Brewing Company in Warrenton, VA. If you haven’t considered joining a club before now, I urge you to do so. If you are in the Gainesville/Manassas area and would like to join us at DOH!, we’d be happy to have you. We meet every second Wednesday of the month at Tin Cannon Brewery from 7:00-9:00 PM (7679 Limestone Dr. #130 Gainesville, VA 20155). If that is too far outside of where you’d like to travel, there are many other clubs in the northern Virginia area. Stephen Boyajian has been an avid homebrewer for 4 years. A fan of many styles, with a particular love for IPA’s and Stouts. He lives in Gainesville, VA with his wife, 3 kids and dog. When not brewing, he enjoys playing golf or playing bass guitar.